Honduras, officially Republic of Honduras (República de Honduras) is a democratic republic in Central America. It was formerly known as Spanish Honduras to differentiate it from British Honduras (now Belize). . The country is bordered to the west by Guatemala, to the southwest by El Salvador, to the southeast by Nicaragua, to the south by the Pacific Ocean at the Gulf of Fonseca, and to the north by the Gulf of Honduras and the Caribbean Sea. The Spanish used at least three different terms to refer to the area that became the Central American country of Honduras. Guaymuras - a name Columbus provided for a town near modern Trujillo. Las Casas subsequently generalized it to apply to the whole colony. Higueras - a reference to the gourds that come from the Jicaro tree, many of which were found floating in the waters off the northwest coast of Honduras. Honduras - literally "depths" in Spanish. Columbus is traditionally quoted as having written Gracias a Dios que hemos salido de esas Honduras (English: "Thank God we have come out of those depths") while along the northeastern coast of Honduras. Honduras is part of Mesoamerica, bounded by the Caribbean Sea to the north and shares borders with Guatemala, El Salvador, and Nicaragua. Access to the Pacific Ocean is through the Gulf of Fonseca located to the south. Honduran terrain consists mainly of mountains (about 81 percent), but there are narrow plains along the coasts and a large undeveloped lowland jungle (La Mosquitia region) in the northeast. In the northeastern region of La Mosquitia lies the Río Plátano Biosphere Reserve, a lowland rainforest which is home to a great diversity of life. Sometimes called "The Last Lungs of Central America," this Reserve was added to the UNESCO World Heritage Sites List in 1982. The region is considered a biodiversity hotspot due to the numerous plant and animal species that can be found there. The jungle is teeming with life with many species of butterflies, bees, ants, flies and larger animals including the tapir, jaguar, puma, ocelot and deer. Honduras created several national parks to protect its natural beauty including Pico Bonito National Park  which enclosed about 415 square miles. In La Mosquitia lies the UNESCO world heritage site, Río Plátano Biosphere Reserve , with the Coco River which divides the country from Nicaragua. The Islas de la Bahía and the Swan Islands are part of Honduras. Misteriosa Bank and Rosario Bank, 130 to 150 km north of the Swan Islands, falls within the Exclusive Economic Zone (EEZ) of Honduras. Like other countries in the region, Honduras contains vast biological resources. This 43,278 square mile (112,092 km²) country hosts more than 6,000 species of vascular plants, of which 630 (described so far) are Orchids; around 250 reptiles and amphibians, more than 700 bird species, and 110 mammal species, half of them being bats. Unlike in more northerly latitudes, temperatures in the tropics vary primarily with elevation instead of with the season. Land below 1,000 meters is commonly known as tierra caliente (hot land), between 1,000 and 2,000 meters tierra templada (temperate land), and above 2,000 meters tierra fría (cold land). Both the Caribbean and Pacific lowlands are tierra caliente, with daytime highs averaging between 28 °C and 32 °C throughout the year. In the Pacific lowlands, April, the last month of the dry season, brings the warmest temperatures; the rainy season is slightly cooler, although higher humidity during the rainy season makes these months feel more uncomfortable. In the Caribbean lowlands, the only relief from the year-round heat and humidity comes during December or January when an occasional strong cold front from the north (a norte) brings several days of strong northwest winds and slightly cooler temperatures. Honduras lies within the hurricane belt, and the Caribbean coast is particularly vulnerable to hurricanes or tropical storms that travel inland from the Caribbean. Hurricane Francelia in 1969 and Tropical Storm Alleta in 1982 affected thousands of people and caused extensive damage to crops. Hurricane Fifi in 1974 killed more than 8,000 and destroyed nearly the entire banana crop. In 1998 Hurricane Mitch became the most deadly hurricane to strike the Western Hemisphere in the last two centuries. This massive hurricane not only battered the Honduran coastline, but engulfed nearly the entire country with its powerful winds and torrential downpours. Throughout Central America Mitch claimed in excess of 11,000 lives, with thousands of others missing. More than three million people were either homeless or severely affected. Most Hurricanes occasionally form over the Pacific and move north to affect southern Honduras, but Pacific storms are generally less severe and their landfall rarer. 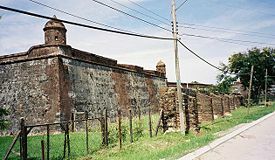 Fort of San Fernando Omoa. Built by the Spaniards to defend against pirates. Archaeologists have demonstrated that Honduras had a rich, multi-ethnic prehistory. An important part of that prehistory was the Mayan presence around the city of Copán in western Honduras, near the Guatemalan border. Here a major Mayan city flourished during the classic period (150-900 C.E.). It has many beautiful carved inscriptions and stelae. The ancient kingdom, named Xukpi, existed from the fifth century to the early ninth century, with antecedents going back to at least the second century. The Mayan civilization began a marked decline in the ninth century, but there is evidence of people still living in and around the city until at least 1200. By the time the Spanish came to Honduras, the once great city-state of Copán was overrun by jungle, and the Lencas, not the Maya, were the main Amerindian people inhabiting western Honduras. On his fourth and final voyage to the New World in 1502, Christopher Columbus reached the Bay Islands on the coast of Honduras, landing near the modern town of Trujillo, in the vicinity of the Guaimoreto Lagoon. After the Spanish discovery, Honduras became part of Spain's vast empire in the New World within the Kingdom of Guatemala. 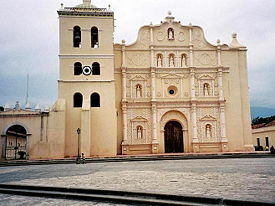 Trujillo and Gracias were the first city-capitals. The Spanish ruled the area that would become Honduras for approximately three centuries. Honduras, along with the other Central American provinces, gained independence from Spain in 1821; it then briefly was annexed to the Mexican Empire. In 1823, Honduras joined the newly formed United Provinces of Central America. Before long, social and economic differences between Honduras and its regional neighbors exacerbated harsh partisan strife among its leaders, bringing about the federation's collapse in 1838-1839. General Francisco Morazán, a Honduran national hero, led unsuccessful efforts to maintain the federation. Restoring Central American unity remained the officially stated chief aim of Honduran foreign policy until after World War I. In 1888, a projected railroad line from the Caribbean coast to the capital, Tegucigalpa, ran out of money when it reached San Pedro Sula, resulting in its growth into the nation's main industrial center and second largest city. Since independence, Honduras has had numerous internal rebellions, civil wars, and changes of government—more than half occurring during the twentieth century. Traditionally lacking both an economic infrastructure and social and political integration, Honduras's agriculturally based economy came to be dominated by United States companies, notably United Fruit Company and Standard Fruit Company, which established vast banana plantations along the north coast. The economic dominance and political influence of these companies was so great from the late nineteenth until the mid-twentieth century that it coined the term ''banana republic''. During the relatively stable years of the Great Depression, authoritarian General Tiburcio Carías controlled Honduras. His ties to dictators in neighboring countries and to U.S. banana companies helped him maintain power until 1948. By then, provincial military leaders had begun to gain control of the two major parties, the National Party of Honduras (PNH) and the Liberal Party of Honduras (PLH). In 1969, Honduras and El Salvador fought what would become known as The Football War, in which five thousand people ultimately died. There had been border tension between the two countries after Oswaldo López Arellano, a former president of Honduras, blamed the poor economy on the large number of immigrants from El Salvador. From that point on the relationship between El Salvador and Honduras was acrimonious. It reached a low when El Salvador met Honduras for a three-round football (soccer) elimination match as a preliminary to the World Cup. Tensions escalated, and on July 14, 1969, the Salvadoran army launched an attack against Honduras. The Organization of American States negotiated a cease-fire which took effect on July 20, and brought about a withdrawal of Salvadoran troops in early August. Contributing factors in the conflict were a boundary dispute and the presence of thousands of Salvadorans living in Honduras illegally. After the week-long war football war in July 1969, many Salvadoran families and workers were expelled. El Salvador had agreed on a truce to settle the boundary issue, but Honduras later paid war damage costs for expelled refugees. Hurricane Fifi caused severe damage while skimming the northern coast of Honduras on September 18 and 19, 1974. Fifi, considered a Category 3 hurricane at the time but finally classified as Category 2, skirted the north coast of Honduras, causing massive flooding from the inflow of southerly winds. It was reported that 24"/610 mm of rain fell in 36 hours across northeast Honduras. The rains collected in rivers, which caused enormous amounts of physical and economic damage to poor villages, small towns, and commercial banana plantations when it skimmed Honduras. Most of the country's fishing fleet was destroyed. Roughly half of food crops, including up to 95 percent of the banana crop, was wiped out. Fourteen bridges were washed away. The cities of Choloma, Omoa, and Tujillo and the island of Roatan were virtually destroyed. The Ulua river valley became a lake about 20 miles wide for several days following Fifi. Only about 20 percent of railroad lines survived the cyclone. Although estimates of the number killed range from 3,000 to 10,000, a figure of 8,000 dead is generally accepted. Most deaths appear to have been caused by flash flooding from the rainfall that accompanied the hurricane. In November 2001, the National Party won presidential and parliamentary elections. The PNH gained 61 seats in Congress and the PLH won 55. The PLH candidate Rafael Pineda was defeated by the PNH candidate Ricardo Maduro, who took office in January 2002. 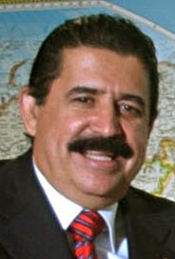 On November 27, 2005 the PLH candidate Manuel Zelaya beat the PNH candidate and current Head of Congress, Porfirio "Pepe" Lobo, and became the new President on January 27, 2006. A presidential and general election was held on November 27, 2005. Manuel Zelaya of the Liberal Party of Honduras (Partido Liberal de Honduras: PLH) won, with Porfirio Pepe Lobo of the National Party of Honduras (Partido Nacional de Honduras: PNH) coming in second. The PNH challenged the election results, and Lobo Sosa did not concede until December 7. Towards the end of December, the government finally released the total ballot count, giving Zelaya the official victory. Zelaya was inaugurated as Honduras' new president on January 27, 2006. His government has generally been considered fragile and he does not hold a majority in the National Congress. His first year in office has been dominated by trying to lessen the cost of procuring oil for the country. Honduras has five registered political parties: PNH, PLH, Social Democrats (Partido Innovación Nacional y Social Demócrata: PINU-SD), Social Christians (Partido Demócrata-Cristiano: DC), and Democrat Unification (Partido Unificación Democrática: UD). The PNH and PLH have ruled the country for decades. In the last years, Honduras has had five Liberal presidents: Roberto Suazo Córdova, José Azcona del Hoyo, Carlos Roberto Reina, Carlos Roberto Flores and Manuel Zelaya, and two Nationalists: Rafael Leonardo Callejas Romero and Ricardo Maduro. The elections have been filled with controversies, including questions about whether Azcona was born in Honduras or Spain, and whether Maduro should have been able to stand given he was born in Panama. In 1963, a military coup was mounted against the democratically-elected president Villeda Morales and a military junta was established which held power until 1981. In this year Suazo Córdova (LPH) was elected president and Honduras changed from a military authoritarian regime to an electoral democracy. In 1986, there were five Liberal candidates and four Nationalists running for president. Because no one candidate obtained a clear majority, the so-called "Formula B" was invoked and Azcona del Hoyo became president. In 1990, Callejas won the election under the slogan "Llegó el momento del Cambio" meaning "The time for change has arrived," which was heavily criticized for resembling El Salvador's "ARENAs" political campaign. Once in office, Callejas Romero gained a reputation for illicit enrichment, and has been the subject of several scandals and accusations. It was during Flores Facusse's mandate that Hurricane Mitch hit the country and decades of economic growth were eradicated in less than a week. Beginning in 2004, separate ballots were used for mayors, congress, and presidents; 2005 witnessed an increase in the number of registered candidates. Although the Nationalist and Liberal parties are distinct entities with their own dedicated band of supporters, some have pointed out that their interests and policy measures throughout the 25 years of uninterrupted democracy have been very similar. They are often characterized as primarily serving the interests of their own members, who receive jobs when their party gains power and lose them again when the other party is elected. Both are seen as supportive of the elite that owns most of the wealth in the country, while neither extensively promotes socialist ideals. In many ways Honduras resembles a democratic version of an old socialist state, with price controls and nationalized electric and land-line telephone services. President Maduro's administration did "de-nationalize" the telecommunications sector in a move to promote the rapid diffusion of these services to the Honduran population. As of November 2005, there were around ten private-sector telecommunications companies in the Honduran market, including two mobile phone companies. Honduras is divided into 18 departments. The capital is the city of Tegucigalpa ("Silver Hills" in Nahuatl, the ancient language of the region) and is located at an altitude of about 3,200 feet and is surrounded by mountains. It acts as the Political and economic center of the country. The heavily populated lowland of San Pedro Sula valley is located to the northwest and is considered one of the fastest growing industrial cities in Central America. Honduras is one of the poorest countries in Central America (along with Nicaragua) and second poorest in the Western Hemisphere with GDP per capita at US$ 3,100 per year (2006). The economy has continued to grow slowly but the distribution of wealth remains very polarized with average wages remaining very low. Economic growth in the last few years has averaged 5 percent a year, but 50 percent of the population still remain below the poverty line. It is estimated that there are more than 1.2 million people who are unemployed, with the rate of unemployment standing at 27.9 percent. In June of 2007 the exchange rate between United States Dollars and Honduran Lempiras was approximately 1 to 18.89. The World Bank and the International Monetary Fund classify Honduras as one of the Heavily Indebted Poor Countries eligible for debt relief, which was given in 2005. In 2005 Honduras signed the CAFTA (Free Trade Agreement with USA). In December 2005, Honduras' main seaport Puerto Cortes was included in the U.S. Container Security Initiative. Both the electricity services (ENEE) and land-line telephone services (HONDUTEL) have been operated by government agencies, with the ENEE receiving heavy subsidies because of chronic financial problems. HONDUTEL, however, is no longer a monopoly, the telecommunication sector having been opened to private-sector companies after December 25, 2005; this was one of the requirements before approving the beginning of CAFTA. There are price controls on petrol, and other temporary price controls for basic commodities are often passed for short periods by Congress. The economy suffered a devastating blow from Hurricane Mitch, the worst hurricane to hit the region in two centuries. The reason Honduras suffered such devastation is due to the mountainous terrain of the country. Heavy rainfall caused flash flooding and mudslides. Also, dirt roads and flimsy houses contributed to the extensive damage. Even if Honduras were a much richer country, the damage would have been similar. The rainfall simply went down hills, burying everything in its path. 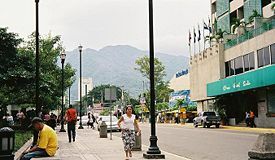 Central Park in San Pedro Sula, Honduras, 2004. The Mestizo population (a mixture of Amerindian and European) has more predominantly Amerindian features, except along the northern coast where, until recently, communities of English speakers maintained a somewhat distinct culture. This is primarily because some islands and some Caribbean coastal areas were occupied by pirates and by the British at one time or another. the Miskito Indians living on the eastern coastline along the border with Nicaragua. The confederation (CONPAH) and each separate group of indigenous people have worked, since the 1980s, for bettering the life of the aboriginal peoples. Change, however, has been elusive as these peoples still face violence and discrimination. About two percent of Honduras's population is black, or Afro-Honduran, and mainly reside on the country's Caribbean or Atlantic coast. The black population comes from a number of sources. Most are the descendants of the West Indian islands brought to Honduras as slaves and indentured servants. Another large group (about 190,000 today) are the Garifuna, descendants of an Afro-Carib population that revolted against British authorities on the island of Saint Vincent and were forcibly moved to Belize and Honduras during the eighteenth century. Honduras hosts a significant Palestinian community (the vast majority of whom are Christian Arabs). The Palestinians arrived in the country in the late nineteenth and early twentieth centuries, establishing themselves especially in the city of San Pedro Sula. The Palestinian community, well integrated in Honduras, is prominent in business, commerce, banking, industry, and politics. Asians mostly of Chinese descent, and to a lesser extent Japanese. Korean, Ryukyuan, Filipino and Vietnamese also make up a small percent due to their arrival in Honduras as contract laborers in the 1980s and 1990s. There is also an estimated 1,000 Sumos (or Mayangnas) that live in Honduras, the majority of which reside on the Caribbean coast. Although Honduras is traditionally Roman Catholic, membership in the Roman Catholic Church is declining while membership in Protestant churches is increasing. There are thriving Anglican, Presbyterian, Methodist, Seventh-Day Adventist, Lutheran, Pentecostal and Mormon churches, and they are all growing rapidly. There are Protestant seminaries. Practitioners of the Buddhist, Jewish, Islamic, Hindu, Bahá'í, Rastafari and indigenous denominations and religions exist. The Evangelical movement is on the increase in line with its twentieth century rise in the other portions of Latin America. Honduran Catholics often believe that saints have special powers. The patron saint of Honduras is the Virgin of Suyapa. Many Catholic homes have a small shrine with a picture or statue of a particular saint to whom they pray seeking help in solving their problems and overcoming their hardship. Towns and villages hold feasts for their patron saints, the most famous of which is the annual Carnival celebrated in La Ceiba on the third Saturday in May in commemoration of San Isidro. At least a substantial minority believe in the efficacy of witchcraft. Religious freedom is guaranteed by the Honduran constitution. The Spanish language is predominant, while (pidgin) English is spoken in the Caribbean Islas de la Bahia Department, but nonetheless is slowly being superseded. Some Indigenous Amerindian languages such as Miskito, Pech, Jicaque, Sumu and Garifuna are also spoken. Spanish is becoming more popular in areas where it was not widely spoken, due to efforts by the government, including making Spanish the language of education. As with much of Latin America, the family is very important in Honduras. Families are sometimes large, and people will usually be in close contact with members of their extended family as there is none of the state support to be found in richer countries. People live in generally smaller and more cramped living spaces than in the more developed world. Most Honduran families have many family members living in the United States. By some estimates well over 15 percent of the population of Honduras lives abroad, almost exclusively in the USA. Honduras has one of the largest women's rights movements in Latin America, as women were fighting for the right to work in factories alongside men in the 1920s, with universal suffrage being achieved in 1954. Women in Honduras have historically been encouraged to be submissive, to raise the children and not take a job outside of the home. The extensiveness of poverty though, has necessitated that many women take jobs to supplement a family's income. A Family Code passed in 1984 gave more rights to single mothers, and made Honduran divorced men take a part in the rearing of their children. However, despite these legal rights, it is very uncommon in rural areas for women to ever ask for or receive any form of child support from children's fathers. This is also greatly impacted due to the extreme number of fathers (and mothers) that emigrate to the United States. Many great writers, such as Ramón Amaya Amador, José Trinidad Reyes and José Cecilio del Valle, have emerged in Honduras. However many people either cannot afford books or have no interest in reading anything other than the daily newspaper, so the market for authors is limited. However, many authors publish their work in newspapers, and there is a tradition, as throughout Latin America, for writers to have begun as journalists. Lucila Gamero de Medina (1873-1964) wrote the first Honduran novel to be published on an international scale. Numerous well-known painters are Honduran. López Rodezno is a Honduran painter who founded the National School of Fine Arts in Comayagüela, which maintains a permanent contemporary art exhibit, featuring many murals by various artists. The famous "Lluvia de Peces" (Rain of Fishes) is a unique phenomenon that occurs in Honduras on a yearly basis for more than a century, when blind fish from underground caves appear on land after a summer thunderstorm. Many artists have painted this phenomenon. Tortillas are extremely popular in Honduras, as is rice. White flour Tortillas filled with beans and Honduran cream and cheese are called baleadas. Fried Plantains, beans, rice and tortillas will make up the traditional Honduran meal, and are an integral part of a vast majority of diets. Deep fried chicken with chopped cabbage is a staple takeaway dish. Dishes on the Caribbean coast and in the Bay Islands tend to use more coconut, and seafood like lobster or fish. In the countryside, people tend to eat beef instead. Meat is often served as kebabs on the grill. Tamales are a popular (called nacatamales) Christmas dish made of baked corn flour wrapped in plantain leaves with beef, pork or chicken in a sauce on the inside. Bananas, rice and both red and black beans are popular staple foods. Soft drinks are consumed with most meals by those whose can afford it. Local fruits include mangoes, pineapples, oranges, and coconuts. Hondurans love football (soccer). The Federación Nacional Autónoma de Fútbol de Honduras runs the popular football (soccer) league while the Honduras national football (soccer) team represents the country internationally. Outstanding players are treated like heroes. Local teams include Club Deportivo Marathón, CD Motagua, Club Olimpia Deportivo, C.D. Platense and Real C.D. España. The love for the game has had violent outcomes as with the second qualifying round of the 1970 Soccer World Cup sparking a war between Honduras and El Salvador, the football (soccer) War, which left more than 2,000 people dead after El Salvador invaded Honduras. ↑ 1.0 1.1 1.2 1.3 Honduras. International Monetary Fund. Retrieved 21 April 2011. ↑ William Duncan Strong. Archeological investigations in The Bay Islands, Spanish Honduras Retrieved June 28, 2007. ↑ Lowri Gilbert. Pico Bonito National Park, Travel-to-Honduras.com. Retrieved June 30, 2007. ↑ UNESCO World Heritage Centre. Río Plátano Biosphere Reserve, Retrieved June 30, 2007. ↑ Honduras.com. History of Honduras Retrieved June 27, 2007. ↑ thehurricanearchive.com. Fifi Hurricane archive Retrieved July 2, 2007. ↑ Rappaport, Edward N. and Jose Fernandez-Partagas. May 28, 1995. The Deadliest Atlantic Tropical Cyclones, 1492-1996, National Oceanic & Atmospheric Administration. Retrieved July 2, 2007. ↑ Gary Cohn and Ginger Thompson. June 15, 1995. A survivor tells her story baltimoresun.com, Retrieved June 27, 2007. ↑ U.S. Geological Survey. USGS Hurricane Mitch Program, Retrieved June 27, 2007. ↑ CIA World Factbook. Honduras, Retrieved June 28, 2007. ↑ World bank. Honduras Country Brief Retrieved June 27, 2007. ↑ US Customs and Border Protection. Ports in CSI Retrieved June 28, 2007. ↑ Inter American Development Bank. Honduras after Hurricane Mitch. Retrieved June 28, 2007. U.S. Department of State. U.S. Relations With Honduras. This page was last modified on 13 January 2018, at 17:33.